Aerts takes World Cup title after Van Aert finishes race disappointed in third. Mathieu van der Poel (Corendon-Circus) outlasted Toon Aerts (Telenet-Fidea Lions) to take the win in Hoogerheide, Sunday. Wout van Aert came third, allowing Aerts to seal the World Cup title. After the wet, boggy conditions of the women’s race, the course had started to dry out, though conditions were still heavy and sticky. Quinten Hermans (Telenet-Fidea Lions) took an early lead, while Van Aert had a slow start. As the first lap progressed, Van der Poel worked his way to the front, with Aerts close behind. Hermans and Corne Van Kessel (Telenet-Fidea Lions) were third and fourth, with Van Aert recovering form in fifth. 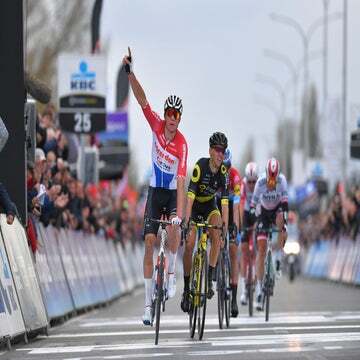 The lead duo of Van der Poel and Aerts started swapping the lead through the first lap and forged a six-second advantage over the field. Van Aert worked his way into third, and with only a three point lead in the World Cup standings over Aerts at the start of the day, had much to chase for. The fight for fourth was between Hermans, Van Kessel, and Joris Nieuwenhuis (Sunweb). Aerts pressed hard through the first lap, leaving Van der Poel behind, crossing the line for the second lap with an eight-second advantage. Van der Poel and Van Aert were now together, fighting for second place. The chasing trio of Nieuwenhuis, Van Kessel and Hermans remained together, 40 seconds further back. Aerts continued to press hard through the second and third laps, growing his lead to 17 seconds. However, in the fourth lap, Van der Poel began to pull Aerts back. Having looked to be struggling only a lap before, Van der Poel distanced Van Aert, leaving his rival several seconds behind. Through lap four, Van der Poel continued to work his way back to Aerts, who looked to be slowing after a dominant first half of the race. Van Aert was now 21 seconds behind the leader, with Van Kessel over one minute back in fourth, and Nieuwenhuis and Van Kessel a further 10 seconds behind him. By lap five, Van der Poel had bridged to Aerts, and the pair scrapped and swapped positions for several minutes. Van Aert continued to battle in third, cutting the lead pair’s advantage to 14 seconds, his stamina coming to the fore. 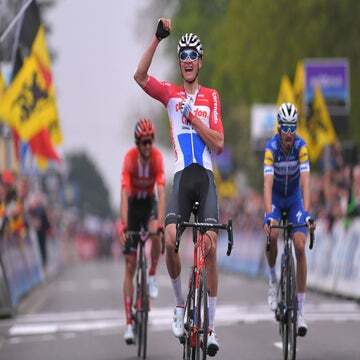 Van der Poel distanced Aerts in the sixth lap, and, when taking the stairs and hurdles on the penultimate lap, Aerts was visibly slowing, his efforts earlier in the race taking their toll. He crossed for the final lap 10 seconds behind Van der Poel. Van Aert came across the line a further 21 seconds behind him. Van der Poel rode out the remainder of the race faultlessly, winning in 1:01:30. Aerts finished the race 13 seconds behind the winner, sealing the World Cup title in the process. Van Aert crossed the line 19 seconds behind him, looking disappointed as the overall World Cup title had slipped away from him. “I chose my own pace and when I had the feeling that I could win the race it got better and better,” said Van Der Poel.